He’s a bit of a hero really.. I am speaking of my brother, Seamus O’Farrell. Last year as it was a significant birthday year for him, rather than party or luxuriate in a nice hotel…. he decided to challenge himself. He took on the cycle from Paris 2 Nice (yes, involves cycling practically the length of France), and in the process raised over €7,000 for Aware (a supporting light through depression). 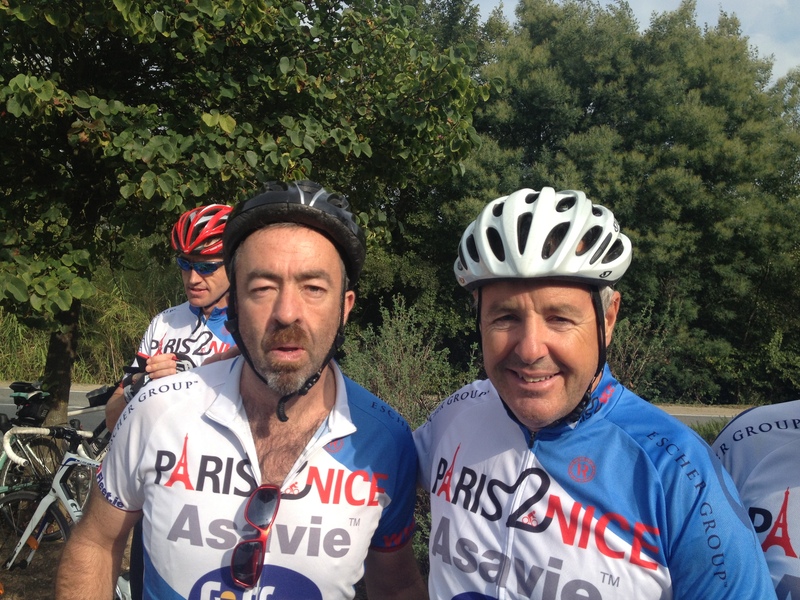 Seamus is off again – being a glutton for punishment – he’s heading back to France in September to once again complete the Paris 2 Nice challenge. This time he is raising funds for Make A Wish Foundation. Make-A-Wish grants the wishes of children living with life-threatening medical conditions, or as a friend of Seamus’ put it “If we can’t make the child’s life longer we can pack more life in”. Back in the olden days I used to cycle a lot. I cycled to school, even cycled to work at one point. Then when that was no longer viable, I joined a cycle club and went on long cycles on a Sunday. When we moved here we thought we could cycle here, but it’s not really feasible – bad narrow and broken side roads, and crazy busy main roads. You’d be taking your life in your hands. So in one sense I am envious of my brother, but also I’m in awe of him…. don’t think I’d have the stamina to undertake such a mammoth task. I had a chat recently with Seamus about the whole experience. Why you decided to take on such a mammoth task? I had always wanted to do something like this. 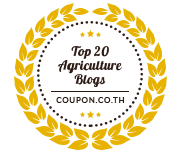 Even on honeymoon in Vietnam I talked about some day cycling from Hanoi to Ho-chi-Minh! Also as I was turning 50, I was looking for something to mark the occasion, I had thought about different sorts of parties (Stars in their Eyes etc) but nothing really grabbed me. Trish (his wife) was also giving me a hard time about not being active enough!….and then a friend I was in Stanford with asked me if I was interested. I remember reading the email on a Saturday morning and asking Trish if I could buy a (proper) bike and she said “Well you can if you use it!” – so that nailed it. What was the biggest challenge last year? 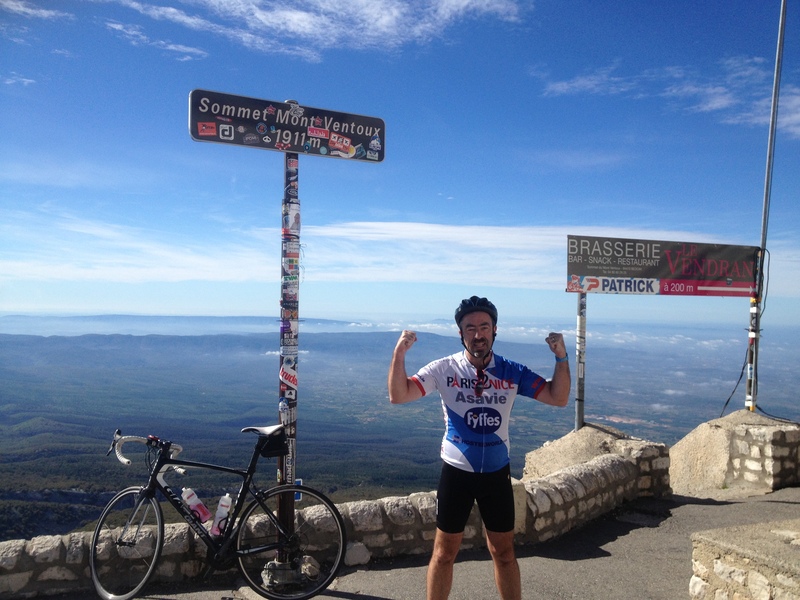 The biggest physical challenge was obviously climbing Mont Ventoux. It has the reputation in cycling circles as the toughest cycle. It is 2,000 Metres climb and 21K long, constantly uphill, it starts at 8% then at about 10K in it goes to 13% for 3k or so, then goes back to 8% (which you’re now starting to think is easy), before going back to 12%. What were the high points of 2013? Both of the above. Getting to top of Ventoux was positive elation. Approaching the bottom of the mountain in the morning I was very nervous and had to make “an unscheduled stop”. But once I reached the top it was an absolute elation to have achieved this thing that had been looming all year. I’ve also made lots of new friends – which you don’t expect to at 50! and I suppose that I’m still cycling and have lost 12Kg since starting cycling 18 months ago! There were very few. On the second morning we were in a town call Gien (?) and coming through the usual industrial estate hinterland that many French towns have – pretty dull and then it started bucketing down and was very cold, and then the group leader got a puncture. So Sunday morning, standing in an empty French industrial estate, pouring rain, cold. But I still thought “this is fun”. The day after Ventoux, we cycled out of Aix-en-Provence, we hit a smallish hill and I could hardly cycle my legs ached from the effort of the day before. But you just have to go on! 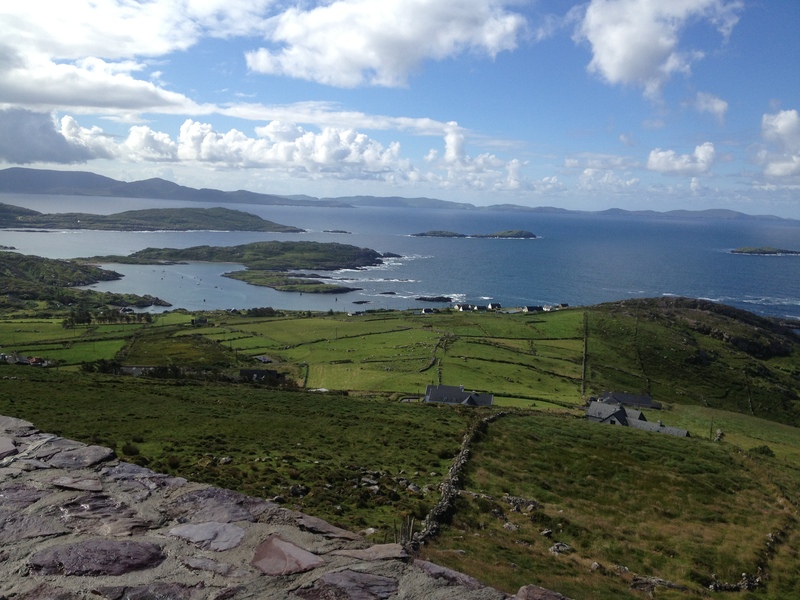 In July this year, me and 9,000 other cyclists did the Ring of Kerry (170k) absolutely gorgeous. Having faced challenges in 2013, what’s the biggest challenge this year? Fundraising! Much harder than last year both in terms of charity fatigue and my own motivation to hassle people. Is he amazing to take on all this? If you can afford anything at all for the Make A Wish Foundation, I know Seamus (and all his family) appreciate it. You can donate anything from €2 here on his charity page. We’ve offered a pig for spit-roasting or bbqing…. will keep you posted with what develops from there. Maith fear! That’s inspirational stuff your brother is at. And your blogging just goes to show how proud you are of him. C’mon the Premier. Hope ye lick the Cats! Wow! Well done you. I keep saying I’d love to get back on the bike, but the roads around here are appalling.